The market for fresh-cut fruits and vegetables has grown rapidly in recent decades as a result of their freshness, convenience, and human health benefits. However, fresh fruits and vegetables deteriorate very rapidly after processing, especially cut-surface browning resulting from wound-induced physiological and biochemical changes. The application of anti-browning agents is one of the most effective methods for controlling the enzymatic browning reaction in fresh-cut fruits and vegetables. Antibraun™ FV is natural occurring ascorbic acid and citric acid extracted from Lemon and citrus, specially designed to prevent browning and discoloration in fresh-cut fruits. 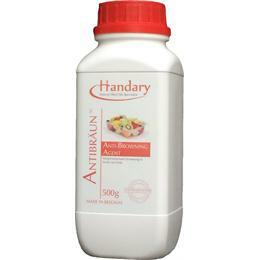 Antibraun™ FV is available in 1L/bottle. 24 months, store unopened below 20°C in dry conditions, away from direct sunlight and odorous products. The ingredients of Antibraun™ FV are generally recognized as safe (GRAS) including ascorbic acid, citric acid and L-lactic acid for preventing browning in fresh-cut fruits and vegetables.